And there’s more bad news: related to species extinction is our changing climate. Because of the relentless burning of coal, gas, and oil, and the logging of forests, our planet is breaking records for heat, month after month. The New York Times reports that: “The five warmest years in recorded history were the last five, and…[that] 18 of the 19 warmest years have occurred since 2001.” The oceans are also breaking records for heat and heating much more rapidly than many scientists had expected, with drastic effects on marine life, coral reefs, and sea-level rise. Land ice is melting. Sea ice is melting. Tundra is thawing. Extreme storms are growing more intense – just think of the humanitarian catastrophe now unfolding in Mozambique, Malawi and Zimbabwe, after a devastating cyclone produced nearly a year’s worth of rain in just a few days. In a perfect illustration of the fundamental injustice of climate change, which hurts poorest communities first and hardest, nearly 3 million people have been affected across this region of Africa, which is one of the poorest in the world. Closer to home, our hearts go out to the ranchers and farmers suffering under torrential rains and record flooding in Nevada and other parts of the American Midwest, with scientists predicting an “unprecedented” flood season in the weeks ahead. Day by day we hear new stories about the painful, even terrifying effects of a rapidly changing climate. And the U.N.’s Intergovernmental Panel on Climate Change warns that we have only a very short span of time – maybe 12 years – in which to avert a catastrophic level of global warming. Like the prodigal son, have we wandered far in a land that is waste? You bet we have. So how sweet it is to reach the story’s next line, its turning point: “When he came to himself…” (Luke 15:17). The young man comes to himself, he turns, and he starts to travel home. That’s such a great line: “He came to himself.” It’s as if he woke up, he broke through the spell, he remembered who he was: created in love, created for love – love for himself and his neighbor, love for the natural world, and love for God. When we come to ourselves, when we are truly ourselves, we begin the journey home to God. Our basic nature, our truest nature, is found as we turn and head toward God, our divine Father and Mother, the lover of our souls and the source of all life. What would it look like if humanity “came to ourselves”? Maybe it would look something like this: one individual after another saying, “Hey, wait a second. We don’t have to live like this. We don’t have to settle for a death-dealing, materialistic society that willy-nilly gobbles up all the land and trees and creatures of this world, extracts and burns dirty fossil fuels, pours toxic pollutants into the water and air, and stuffs the landfill with plastics and waste. 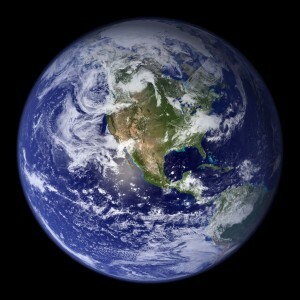 We don’t have to settle for a suicidal course that steals a habitable world from our children. Through the grace of God we can make changes in our own lives, so that we live more gently and lovingly on the Earth, and we can resist and protest the powers-that-be that are determined to make huge profits by treating people and planet alike as completely disposable, extracting every last drop of oil and gas and every last ounce of coal, and cutting down every last tree.” We can say to ourselves, “I’m going to turn my own life around and make the changes I can make, and I’m also going to stand with all the people of the world who want what I want – a society marked by generosity, not greed; by justice, not prejudice and inequity; by love, and not indifference and hate.” Like the prodigal son, we can say to ourselves “I will get up and go to my father” (Luke 15:18) and begin the journey home. If you’d like to discuss the specific things we can do as we make that journey, and talk about everything from electric cars to the Green New Deal, I hope you’ll meet with me after the service. You know, the journey we’re undertaking will not be an easy one, for the challenges ahead of us are great and the corporate and political powers arrayed against us are strong. The IPCCC tells us that in order to avert climate chaos and the possible collapse of civilization, humanity has to change course at a scale and speed that is unprecedented in human history. So, yeah, as we rise up to fight for a better world, sometimes we’ll find ourselves wrestling with feelings of helplessness, grief, and even despair. I’m so interested in what gives us strength and energy to keep going that I just finished co-editing a book of essays with my friend Leah Schade, which will be published this fall. It’s entitled Rooted and Rising: Voices of Courage in a Time of Climate Crisis, and it’s a collection of essays by 21 faith-based climate activists, reflecting on the spiritual practices that sustain us. You know, God loves it when we come home. God gets happy when we who are lost are willing to be found. 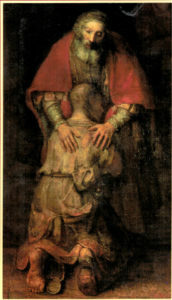 That’s what Jesus shows us in the next part of the parable: the father, who has evidently been waiting eagerly for his son’s return, catches sight of him while he is “still far off” and, “filled with compassion” (Luke 15:20), runs out to greet him and catches him up in his arms in an exuberant embrace. The story of the prodigal son is a grand story about reunion, about being lost and being found, about forgiveness and reconciliation. May it be our story, too, as we come home to ourselves and turn our lives toward loving God and all our neighbors, including our brother-sister beings and the Earth upon which all life depends. 1. The Book of Common Prayer (The Seabury Press, 1979), 450.